This screenshot shows the Workspace Manager ("Clip") in the upper right corner, beneath it the dock (this is the default setup and only has launchers, not apps). The menu system is displayed, showing some of the many styles/themes. At the bottom of the screen are icons for the active/iconized processes. I used version 0.80.2 from November 2003. 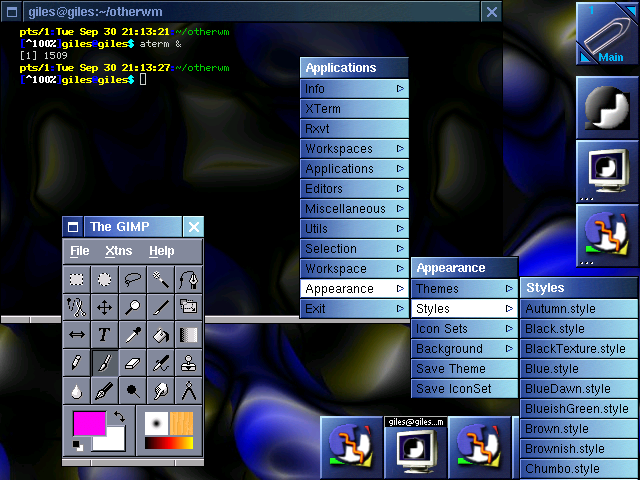 This is the most recent stable version as of October 2003. Not impressive. You can patch together what you need to know from multiple sources in various places, but the man page is weak and there's no other single point of entry. Yes, although the changes are mostly colour, not radical changes of shape, size, or behaviour. Based on the NEXTSTEP window manager for the NeXT operating system. It shares this heritage with AfterStep, and their appearance and behaviour are similar, although they've diverged over time. WindowMaker has multiple workspaces, but you start with one and create your own as you go. It will save these on exit if you tell it to, but that's not the default. You can rename them, which is nice. Changing workspaces is done with the "Clip," which hangs around in one of the corners. You click the triangles on its corners to cycle up or down through the workspaces. It doesn't wrap around at the end of the listing by default, but that can be changed. Default focus style is Sloppy, but this is also optional. Very small memory usage: about 1Mb. Awkward workspace changing technique. Dock will launch only one instance of a program. Several mailing lists, and some IRC channels. Activity on the wm-user mailing list seems to have halted in March 2003, but the developer list remains active.